Markets are roaring higher still after yesterday’s continued draw. Crude gained over a dollar during yesterday’s session to close the day at $65.61, setting yet again its three year record price. Crude is continuing its upward hike this morning, gaining another 68 cents (1.04%) since yesterday’s close. Prices are currently trading at $66.29. Both products are tracking crude higher. Diesel had a strong day of trading on Wednesday closing 1.72 cents higher than its opening price. Diesel continues to soar higher this morning gaining another 1.02 cents (.48%) to bring prices to $2.1163. Gasoline also closed the day higher yesterday, though it performed slightly weaker than diesel, increasing by just 95 points. Gasoline prices have added another 37 points (.19%) today to trade at $1.9201. 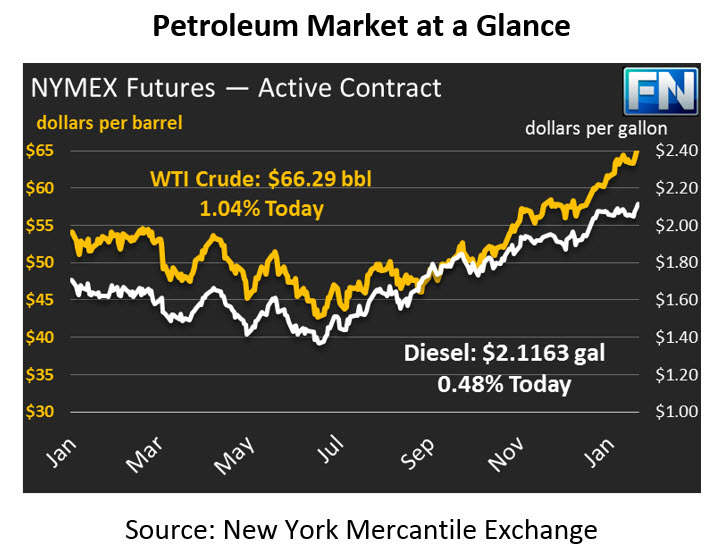 Yesterday’s small crude draw gave the market the fuel it needed to continue its rally. Crude stocks are bucking the seasonal trend – crude prices typically rise in January and continue rising until March or April. So far this month, inventories have fallen 7.9 million barrels. Over the past 30 years, crude stocks have risen 70% of the time, and the last time crude stocks ended January this negatively was in 2000. Don’t count crude out though – refinery run rates are declining which is reducing the demand for crude oil, which could bring a build next week. A low dollar is also helping give crude a boost. Speaking at the World Economic Forum in Switzerland, U.S. Treasury Sectary Steve Munich commented that a weak dollar is beneficial for the U.S. economy, spurring lower dollar values yesterday. The US Dollar Index started the year strong, but has since fallen drastically as a government shutdown and Munich’s comments have caused faith in the dollar to fall.